Hello everybody, this is Ben calling in here with Team 5 on Kilimanjaro. We are at our first camp, at Machame Camp this evening (at around 10,000 feet). 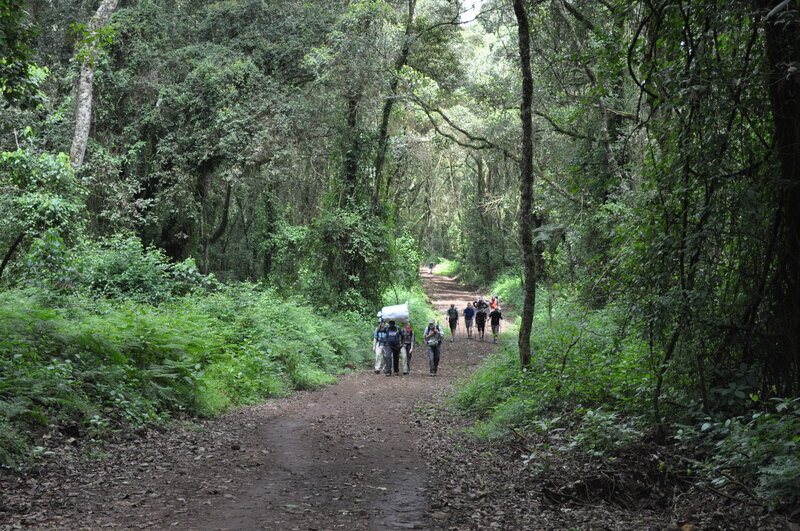 We started at about 5,800 feet today at the Machame Gate and ascended just a little over 4,000 feet today coming up here to Machame. Everybody did an awesome job today, was feeling really good getting up here. We’re excited to get a good night’s sleep after a couple days of travel to Africa and a pretty filled day yesterday with the gear check and orientation and everything. So I think everybody’s going to sleep good tonight especially after about a six hour hike today. But everyone’s feeling great. We had a little bit of rain pretty much all day today, so we got a little wet coming up here but it wasn’t too bad; it did keep the temperature down a little bit though, it was kind of nice and cool for hiking today, so that was nice. We’re all headed off to bed now. We just had a delicious dinner; we had some steak, some salad, and some potatoes, and a banana fritter for dessert. So we’re full, we’re heading off to bed, and we’re excited to start climbing higher on the mountain tomorrow. Tomorrow we’ll head up to the Shira Plateau, where our second camp is (at about 12,300 feet). And we’re going to have about a five hour hike or so to get up there. We’ll let you know how tomorrow goes. Hopefully it’ll be sunny for us tomorrow. But again, everybody’s doing great and says “hello” to everyone following along back home.